As I said, we made the news with our ceremony, and here is the piece. Thanks go out to all involved, with special thanks to Joe Martinez, who nearly died of a heat stroke in the Vader costume; my brother Dan, for helping pull it all together; Eric Decker, who threw out his back taking pics (which I hope to see soon! ); Leonard Zahare and my nephew Devan Harrison for their spirited Jedi interloper roles; and reporter Sam Griswold at CBS 42 who filmed this and send us the edited piece. And to Jess, of course, for being there. Well, I have returned from my vacation/wedding/honeymoon/scifi convention, and I am doing my best to pick up all of the threads I left on the ground before I left. The house still needs much work to be settled, and I feel it all the more because I’ve been living out of a suitcase for weeks. We still have boxes of ‘stuff’ everywhere. It’s hard to find the simplest of things because so much still needs to be unpacked and put in its place. It’s basically on top of my agenda to get things sorted out by the weekend so I can actually relax a bit. It’s just too hard when I am surrounded by work I know must be done. At least I can now check off ‘buy house’ and ‘get married’ from my to-do list. However, it has come to my attention of late that a new item, ‘have kid’, has been scheduled for about nine months in the future. 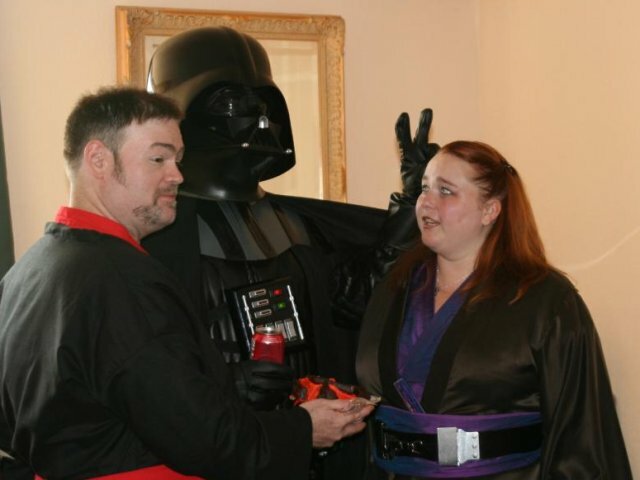 It would seem our ceremony aligned well with the vibrations of The Force. So, this penny dreadful novel I call life will have a new character, hopefully a great hero, or at least a great villain, and not some drab, mediocre, unnamed stable hand or bar maid who never ventures more than a few miles from home. Names are important and symbolic, so let this new character be well named. For that, we must think long and long. Fortunately, we have some months, due to simple mechanics. I’m on vacation, so I am disinclined to write overmuch, but this needs to be posted. Looks like we made the news. Apparently, there is also video that was broadcast on the news, but it’s not up on the site yet. If I can lay hands on it, I’ll be sure to link it. You are currently browsing the Nihlos blog archives for July, 2008.